In the kitchen, I am glowing in the humidity underneath a wash of pale spotlights. Outside in the dark yard, the cedillas emit their ceaseless din. Rubbing my strained eyes I wonder, with a heart pumping fast, could there be someone out there looking in at me? A toad releases an ungodly belch. Nothing feels normal. Moving through to the garage, I locate a familiar looking screwdriver, large and heavy in my hand. I know I need it, but can’t remember why. Turning to leave, I press the wrong switch and jump as the garage door clangs loudly and begins to rise up into the gloom. As it lifts up and out, a downpour of Hollywood proportions comes in to view. The rain is making V shapes as it hammers on to the drive. I feel my senses ambushed and shiver perversely in the heat. I stab at the switch repeatedly and beat a hasty retreat. My chest is tight and skin prickling inside swaddled sheets. Bound like an Egyptian mummy I try to free my heavy legs. Rain is lashing down on the bedroom roof. 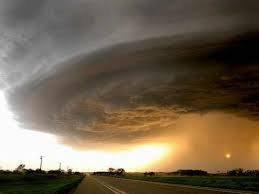 I suspect most of us have memories of an extraordinary weather event and have felt the unstoppable powerful of nature at her worst. Hurricane Ike was special to Houston; the eye of the storm covered the width of the city. Houston took a direct hit. It is perhaps a cliché to recount a dream sequence, but aren’t dreams fascinating? They inform us, provide a commentary from the unconscious. Watching news footage undoubtedly tapped into mine, giving me nightmares. Sensations that passed through my body five years ago, recalled in the here and now, while I slept. It wasn’t life threatening for us, although sadly approximately 200 people did die as a direct result. It was a slow trial; a test on the nerves. The aftermath was at best inconvenient. At first there was a sense of adventure, the ‘together in the trenches’ moments. 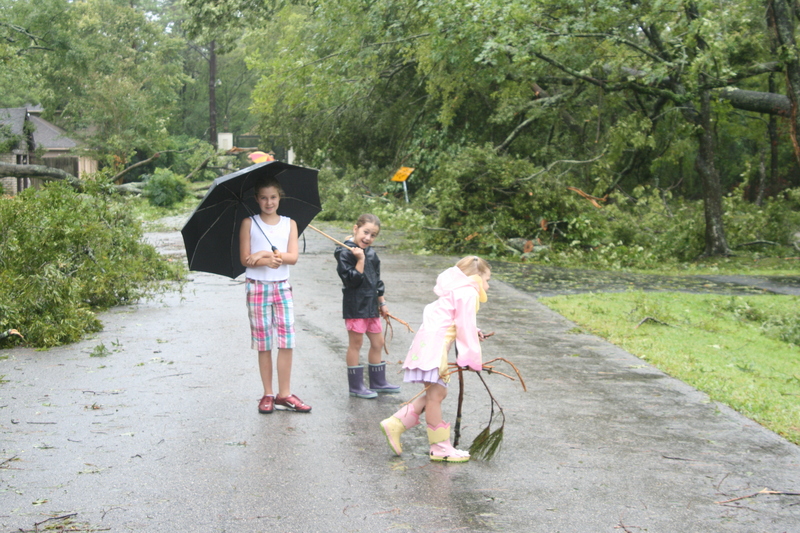 In the photo you can see our children inspecting our neighbourhood the morning after Ike. In 1986 the Kent weather event caused significant damage and yet it wasn’t a true hurricane. Another crucial difference was it happened without warning. The BBC weatherman, Mr Fish, famously poo poo’d the idea of a hurricane coming when he read the weather forecast on the evening before. As a result the fear of what might play out was absent. Back then; I woke at 2:00 am to a chorus of unfamiliar whistles and crashes. I was awestruck by the chaotic scene in the street below my flat. Trees bent double, trash-cans bounced down the street like discarded newspaper. Unable to make sense of the scene and alone in my little flat, I went straight back to bed and slept on. Oh to be young and carefree of life! When you are an expat you take what the posting brings as part of the package. You expect the unexpected (some of it very positive) and you cope as best you can. The ten day build up as Hurricane Ike made it’s way across the Gulf of Mexico and subsequently the certainty of it’s impending arrival, were scary. And yet there was no time to deal with the anxiety, hurricane preparations – boarding windows, gathering essential supplies took over. Dealing with the unknown, the unexpected and feeling out of control are some of our most stress inducing experiences. So how might we cope with uncertainty coupled with fear? 1) Thinking logically when you are feeling anxious is challenging, so a clear head will be help. I recommend you stop what you are doing and sit down, now tell yourself to relax. Easier said than done? Take a deep breath in through your nose to the count of ten and then breath out through your mouth, slowly to the count of ten. Relax your jaw and facial muscles. Do this seven times and you notice as you begin to feel calmer. Repeat this as many times as you need to. 2) Ask yourself, What is the worst that can happen? Consider what action you can take now to prepare or help ease your situation. If you are truly powerless over events (a rare occurrence) commit to staying calm, this will help maintain a sense of control. 3) Remind yourself ‘This too shall pass’. 4) Distracting ourselves can be a way of ‘avoiding’ particularly when we know we should be doing something we don’t want to! Conversely, at times of great stress, distraction or displacement activities can allow us the space to calm down. For example, studies have shown that doing something with your hands that doesn’t require much thought, such as knitting, will help. Moderate exercise is another good stress buster. 5) Remind yourself that although uncertainty is difficult to tolerate, it is not impossible to do so. Recall a time in your life when you coped with not knowing what was going to happen. With the benefit of hindsight, what have you learned from surviving that experience? 6) Mindfulness can help us to still the mind and stay focused. Do you have memories of unexpected events? Would you would like to share your experience and possibly what you learned from them?